I’ve wanted to return to Sci-Fi Undercover for far too long and this novel gave me no choice. 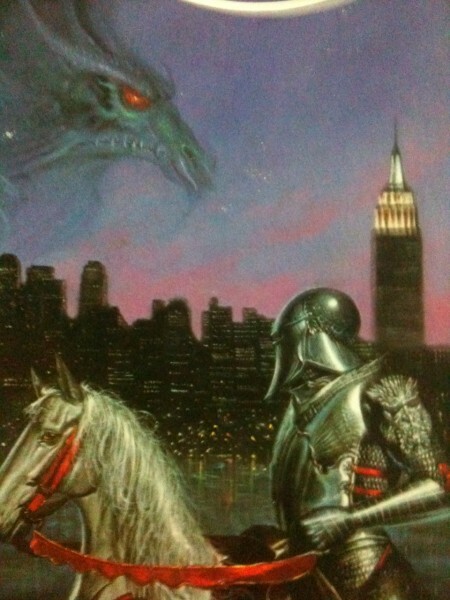 Probably the most outlandish cover art I’ve encountered since I started looking, I bought New York by Knight on sight. And it follows the rules, thankfully–published before 1990 and by an author I haven’t yet read or heard of. And I already used up my one ‘do over’. That’s right–the last time I explored this feature I was utterly defeated by this thing. While having the appearance of a science fiction novel, Pandora’s Box was actually an enchanted item that sucked all fun out of my life and sapped my will to read page by page. In a world where each character was tragically born without a personality and the entire plot is detailed on the back of the book–reading wasn’t just a chore, it was replacing your shower curtain and rings with that dollar store brand that makes your fingers bleed. But, right–this new book by Esther Friesner has to be a step in the right direction. I don’t remember this episode of Seinfeld. It’s like individual plot lines from several bad movies came together for a drunken night that everyone regrets and, despite what everyone claims on Facebook the next day, it really did happen. I bought my copy for $1.50 in Berkley and have a feeling it’s worth at least $1.75. Check back later for my full exploration of the novel, author, cover art, and perhaps I’ll even track down the mysterious unlisted cover artist!